IDW’s Tales from the Cobra Wars debuts! In a new twist, IDW is publishing a prose short-story collection of all new G.I. Joe fiction! Max Brooks (author of World War Z and G.I. 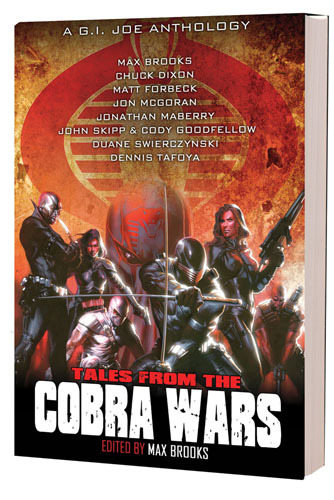 Joe/Cobra) edits this brand new volume with tales featuring our favorite Joes and Cobras. Aside from some movie tie-ins released in 2009 and the old Find-Your-Fate series, this marks one of the only times that Joe has been featured in prose! I pre-ordered this book back in December on Amazon.com when it was first listed and I’m waiting for that box to hit my doorstep on Friday! Consider my weekend reading already accounted for! GI JOE: Tales from the Cobra Wars is an action-packed collection of all-original prose stories. Flint, Scarlett, Destro, the Baronessâ€•they’re all here as the ongoing war between GI JOE and COBRA is depicted from every angle. This trade paperback presents eight novella-length tales, penned by today’s leading crime and thriller writers, such as Jonathan Maberry, Duane Swierczynski, Chuck Dixon, and Dennis Tafoya. Cobra Wars is edited by Max Brooks, who also supplies a new story, and features new illustrations for each story. If you’re still looking to order, Amazon.com has it available now for $11.55! While you’re at it– they’ve got pre-orders up for G.I. Joe: Special Missions vol 4 and G.I. Joe Classic vol 11!